Summer days at the public pool. 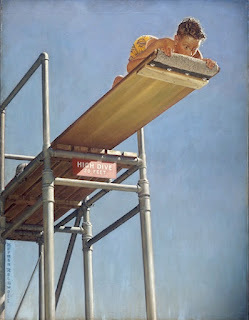 For just one dollar, you too can jump off the high-dive, marvel at lifeguard tanning abilities, check out the latest mommy tattoos, and repeatedly give your kids a thumbs-up for doing water acrobatics - not to mention stare down the day camp bullies. That was me yesterday, along with two of my sisters. We were all, "Oh no you dit-ten." Fierce like momma bears. Or momma piranhas, working as a team. Four boys against one? Wasn't going to happen on our watch. 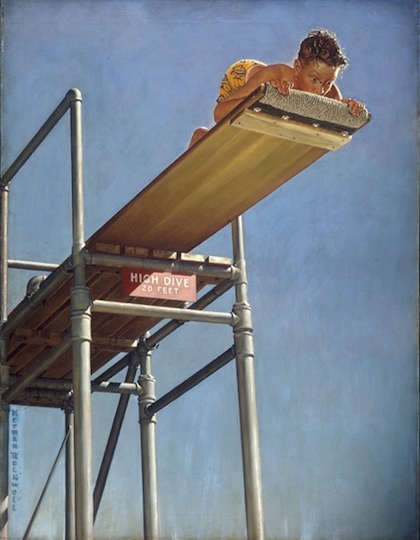 We first noticed this "well-fed" boy with red hair and freckles attempting the high-dive. More like walking the plank to his doom. But he chickened-out last minute. Doesn't matter. Either way down, the bullies were waiting. The boy quickly jumped in from the side. The bullies jumped in after him. He got out of the pool. The bullies followed. Splashing and taunting the boy, it appeared he didn't swim well - if at all. Not sure what they were saying, though - just knew it was mean. Three sisters - what a team. We were a cord of three strands not easily broken (Ecclesiastes 4:13). And this kid wasn't even ours. Something just kicked in. An instinct to protect - perhaps hardwired within us by a God who is a shield around us and lifter of our heads (Psalm 3:3). Someday we'll be reading your book!